What role does self-interest play in building a strong network? 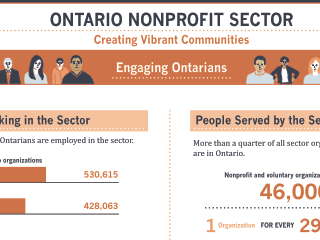 I attend the seventh annual Ontario Nonprofit Network (ONN) Conference to find out. 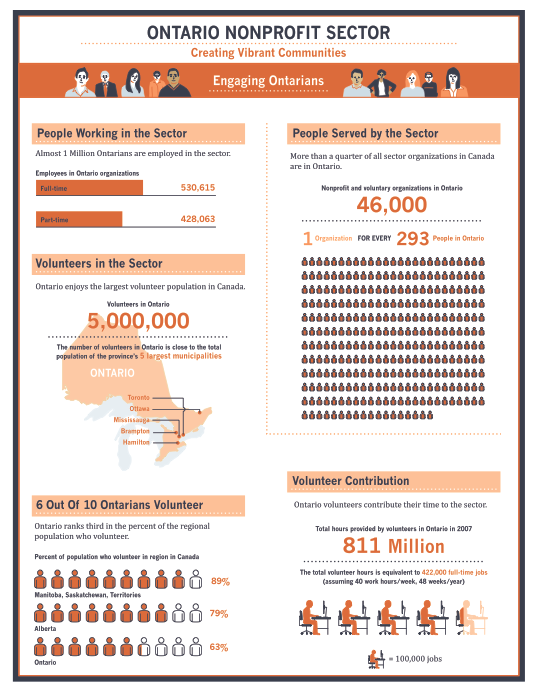 The growth of the conference over the last seven years represents the increasing interest in creating a collective community of non-profit organizations across the province as we continue to recognize the need to collaborate and learn from each other—or rather, the need to connect, engage and act, which is the motto of ONN. The theme for ONN’s 2014 conference was “Emerging Strategies,” with a strong focus on the idea of connecting non-profits in order to create a thriving sector. After the opening plenary—which included welcoming addresses from Michael Chan, Ontario minister of citizenship, immigration and international trade, and Deborah Matthews, Ontario’s deputy premier—we were challenged to consider three ideas to start the day. Three ONN board members were given five minutes and five slides to express each idea. Here I learned the true potential of networks and the strength of numbers and connections. 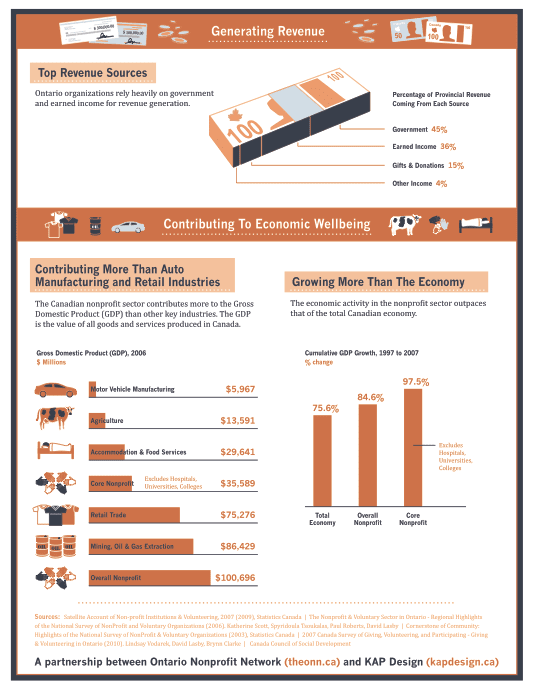 The non-profit sector is often underrepresented—itmakes up a massive part of the province, employing over one million people and contributing to the gross domestic product as the fourth-largest sector. One of my favourite ideas to come out of the day was that of shifting away from the idea of a “non-profit” sector (as the word “non” has negative connotations), and toward the notion of the “public benefit sector.” I think it’s a far better term to represent the type of work we do. In the afternoon I had the chance to attend two breakout sessions, with each one challenging me to think differently. Instead of focusing on what is not working, this session focused on what is working and how we can build momentum from those strategies. The panel consisted of MaRS’ own Sarah Doyle, senior policy advisor at the Centre for Impact Investing; Tonya Surman, CEO of the Centre for Social Innovation; Norm Tasevski, co-founder and director of Purpose Capital; and David Stevens, who practises charity law at Gowlings. The session, which encouraged communication between panellists and attendees, touched on the notion of hybrid legislation whereby non-profits act more like revenue-generating businesses, but within the boundaries set by Canada Revenue Agency. Hybrid legislation is an extremely complex matter that has numerous positive elements, but also poses potential risks. It was really interesting to hear the diverse perspectives of the panellists on this topic. As I previously mentioned, one of my biggest a-ha! moments at the conference was understanding the importance of self-interest when it comes to creating strong networks. This panel, moderated by one of my favourite previous bosses, Dave Kranenburg, director of programming at the Centre for Social Innovation, featured three engaging speakers: Sarah Eisinger, executive director of The Nonprofit Centers Network; Anne Gloger, founding director of East Scarborough Storefront; and Colette Murphy, executive director of the Atkinson Foundation. The panel focused on the important role that networks play in accomplishing big tasks, the role that physical spaces play in cultivating them, and the trust and time needed to build them out. The following are my three biggest takeaways from this panel (brought to you by the letter “T”). Trust: Intentionality and a shared common purpose are essential for all parties involved. Transparency: This is where the idea of self-interest is important. Everyone should come to the table authentically expressing what he or she is looking to get out of the network. Time: A hefty amount of time and energy go into building strong and effective networks. They don’t just happen overnight! If you want to discover more of the great work that ONN does and are interested in membership opportunities, you can learn more here. Needless to say, I am looking forward to attending next year’s conference.